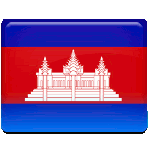 Constitution Day is a Cambodian national holiday celebrated on September 24. It commemorates the re-coronation of King Norodom Sihanouk and the adoption of the Constitution of Cambodia in 1993. Norodom Sihanouk was first crowned King of Cambodia in 1941 after the death of his grandfather Sisowath Monivong. In 1955, following the country's independence from France, Sihanouk abdicated in favor of his father and took the post of Prime Minister. In 1967, the Khmer Rouge rebelled against the Cambodian Government, starting a civil war. Three years into the war, Sihanouk was deposed and had to flee the country. In 1975, Pol Pot officially became the leader of Cambodia and established a dictatorial regime. Four years later Pol Pot was overthrown, and the People's Republic of Kampuchea was established. The PRK failed to secure US endorsement. In the early 1990s, the transitional period began. Prince Norodom Sihanouk was reinstated as head of state. Following the elections held in May 1993, the 120-member assembly approved a new constitution that established a constitutional monarchy. On September 24, 1993, the new constitution was promulgated, and former Prince Sihanouk was elevated to King. This date was designated as a national holiday.